Larson Electronics' Magnalight.com added several new handheld spotlights and remote controlled spotlights in time for the Christmas holiday. Dallas, TX (PRWEB) November 25, 2008 -- The new lightweight, ultra-durable handheld spotlight, the HL-85, is a 5 million candlepower 12 volt spotlight that can be adjusted to produce a directed spot beam 900 feet long or a wide flood beam for work area illumination. Made from high impact nylon and equipped with a detachable 16 foot coil cord, this halogen light runs directly off of the vehicle's cigarette plug. The High Intensity Discharge powered HL-85-HID spotlight emits 3200 lumens, helping the hunter, farmer or workman sees objects 1900 feet away. Both spotlights operate directly off of 12 volt power, which makes it applicable for operators of cars, trucks, ATVs, snowmobiles and boats. "We wanted to produce a handheld light that was lightweight and durable, while also enabling the operator to operate the same light as a spotlight or a floodlight," said Rob Bresnahan, President of Larson Electronics. 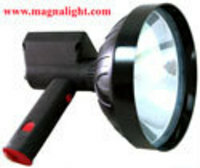 "Magnalight.com is strongly geared to military and industrial applications. We are known for our 24 volt HML-5M military spotlights, which are given to every deployed soldier in Iraq in their EOF kit. We also supply petrochemical companies and oil field operators with a wide range of explosion proof lights, remote controlled lights and intrinsically safe flashlights. In most cases, the same people that are using our industrial grade lighting during the week are also hunters, ranchers, etc. on the weekend. As a result, we wanted to offer a lightweight, durable handheld spotlight that could hold up under industrial use, but be effective at the hunting camp as well. Offering a light that can be configured as a flood light for up close working applications or changed into spotlight mode for spotting and hunting addresses our customer's diverse needs." "Every year, we get a lot of calls from women searching for a unique and practical Christmas gift for the men in their lives. Our new handheld spotlights are unique and practical answers to their search for interesting gifts for their husband, father or brother that works or hunts. Along those same lines, we recently introduced two new upgrades to the Golight remote controlled light line. We added camouflage models, including the GL-3085 and the GL-2081 with a compelling brown and green hunting pattern," Rob continued. "Hunters can use a wireless remote control at distances of 150 feet to position the beam of the spotlight on targets up to 850 feet away. Remote controlled HID Golight spotlights have always been popular Christmas gifts for men, but this year we released camouflage models which we think makes an exciting extension to the traditional black, white and chrome models we already have." "For the long range varmint hunter, rancher or farmer needing more distance, we just finished the release of our HID Golights, equipped with 3200 lumen High Intensity Discharge bulbs that enable the remote controlled spotlights to illuminate objects more than 2100 feet away, said Rob. "These new models, like the GL-3049H (black), GL-3067H (white) and GL-3085H (camo), also enable the operator to control the light beam at distances to 300 feet. We tripled the length of the beam of the stock Golights and doubled the effective distance of the remote control with these new upgrades. Women searching for unique and practical Christmas gifts for the men in their lives will discover several exciting options this year at Magnalight.com." You can learn more about Larson Electronics' wide range of 12 volt handheld lights and new HID Golight remote controlled lights at www.magnalight.com, or by calling 1-800-369-6671.